Coffee mornings are available from 10.30am with guest speakers. Meet at Manor Farm Library the 2nd and 4th Thursday of the month. Time 6pm to 7.30pm. Songs, rhymes and stories for babies and toddlers – Wednesdays 10.30am to 11.00am. Parents/Carers are asked to stay with the under 5’s to ensure the toddlers safety. Every Tuesday 6.00pm to 7.30pm. Meet on 1st Thursday of every month starting 3rd October 2013 6pm to 7.30pm. For more information email: . Held on the 3rd Sunday of each month from 10am to 3pm in and around the Great Barn. Free parking and friendly dogs are welcome. Held on the first Sunday of each month from 10am to 2pm in and around the Great Barn. With around 30 local producers of food, face painting, pony rides and much more for children. See www.duckpondmarket.co.uk for further information. Mad Cat Crafts (shop at the front): Hand painted and decorated objects for the home and garden. Ruislip Sinfonia Community Orchestra are looking for more players. Ruislip Bowls Club is open to all adults. A very friendly bowls club. Social Activities including – Gala Day, Drives, Coach Trips and a Christmas Party. For more information: Contact David Barnes on 020 8868 8697. Ruislip & District Natural History Society was founded in 1949. Meetings are held in the Ruislip Guide Hut, (next to The Great Barn in Bury Street) starting at 8.15pm. The society covers a wide range of natural history interest topics and are usually illustrated with slides of digital images. Come on the outdoor walks. Visit attractive areas in good company and learn, and see something new. Meet local people who are also interested in all aspects of natural history – birds, wild flowers, bats, other mammals, dragonflies, conservation, countryside appreciation etc. Receive the newsletter and keep in touch with local wildlife matters. For more information : www.ruislip-districtnhs.co.uk. Every second Wednesday of the month at 2pm in Winston Churchill Hall. Cost £42 per year. Ten lectures a year about art and culture from around Britain and further afield. See website or phone Ann Lowe on 01895 638147 for details. The Tea Dance is hosted by Terry and Rita Crump usually on Thursdays from 1:30 to 4pm. This is now free entry under the Hillingdon residents over 65s activities program but those outside the borough are still welcome as guests of a Hillingdon resident. Advance booking is advisable; telephone 01895 556688 or Book online. Once again the booking system has been revised and booking will available when attending the previous dance and up to the Monday before the dance date. There is no tuition at this event. See the Events Calendar for dates. 73 Pembroke Road, Ruislip HA4 8NN 01895 632739. Pre-school Mon – Tues – Wed – Fri 9.30am to 12.00 noon. For more information call Mrs Gadwell on 01895 632560. Up to 2yrs 3mths – Monday to Friday 9.15am to 11.05am – Term Time Only – £7.50 per session – 07919 206502. Age 5 to 7 – Thursday 4.30pm to 5.30pm – Term Time Only. Age 7 to 10 – Tuesday 6.00pm to 7.30pm – Term Time Only. Age 10 to 14 – Friday 7.00pm to 8.45pm – Term Time Only. For more information on the above please call 01895 631239. Wednesday 1.00pm to 2.30pm – Term Time Only – £1 per family. Friday 10.30am to 11.30am – Free of charge. Ickenham Road, Ruislip HA4 7BZ 01895 632826. For more information contact Mike Paddy on 01895 637389. Events programme see www.thefrms.co.uk/affprogs/rgs.htm. Pre-school classes combining Movement, Music and Fun. Monday 10.00am to 10.40am for ages 1-2; 10.45am to 11.25am for ages 2+. For more information phone Vanessa on 07712 588177. A wide range of music – First term free for new members. Held on the first Tuesday of every month 2pm to 4pm. Find out more: Barbara Capp 01895 638495. Eastcote Road, Ruislip HA4 7AU 01895 624498. Monday 11.30am to 1.30pm for Beginners and Improvers. For more info call Gina on 07905 410431 or www.yoga-4-you.co.uk. A fully qualified and insured yoga instructor. Tuesday 1.30pm to 3.30pm. Entrance £4 to include refreshments. On a Wednesday lunchtime at 12.15pm a wonderful concert is held which is free to all who wish to attend. A 45 minute workout on Wednesday and Thursday mornings between 9.15am and 10am. For more information call Maggie on 07769 567430. Thursdays 4.45pm to 5.45pm, age 5-7. Tuesdays 6.00pm to 7.30pm, age 7-10. Fridays 6.30pm to 9.00pm, age 10-14. Up to age 6 – £80 for three hours and includes use of the kitchen. Ruislip High Street – located at the end of the passageway in between Daisy Chain Florist and Metro Pizza. The Royal British Legion are looking for new members – all you have to do is visit the club pick up a form from over the bar, complete and return. Anyone over the age of 18 can apply to join. “The club has a fantastic snooker table so dad, why not join and then bring along your young adults and have a game of snooker, it is great for bonding with the teens in the family and beats sitting in front of the TV at home. Has a huge TV for all the footie etc. Low price drinks and friendly faces. At lunchtime: toasted sandwiches, selection of coffees all at very, very competitive prices. It really is a very friendly place so why not join today. Please ring 01895 632328 for more information. West End Road, South Ruislip HA4 6QX. The WI meet on the 1st Thursday of each month at 7.30pm to 10.00pm in Upper Room, GAA Sports & Social Club. For more information: Kim Murphy 07989 558925 or email . Grosvenor Vale, Ruislip HA4 6JQ. 01895 637487. 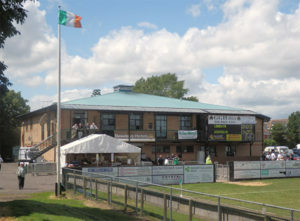 Home of a thriving social club and football team. Three bars and function hall. Lots of activities. ruislipsocialclub.co.uk. Football in the National League South. wealdstone-fc.com. Friday night live popular music; some Saturday and Sunday specials. tropicatruislip.co.uk. Thursday night 50’s style lessons and club dancing; 8 – 11pm. jiverevive.co.uk. Maxwell Road, Northwood HA6 2YE. The meetings take place at Northwood College on the first Tuesday of each month. For more information contact 01923 829621.